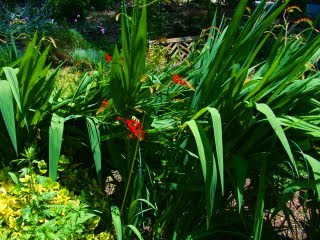 Right here in Asheville, NC, the red hot lilies are just beginning to bloom. 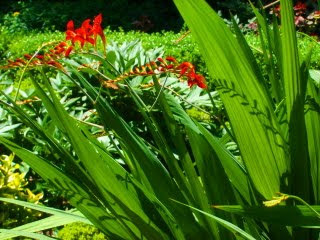 I refer, of course, to Crocosmia "Lucifer". 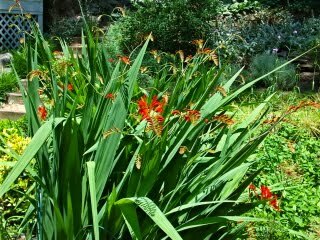 Named for the 'red-hot guy' himself, these lovely plants have fronds which produce bright red multiple blooms. Blooms start coming out at the stem end and move forward to the tip until it's all in bloom. 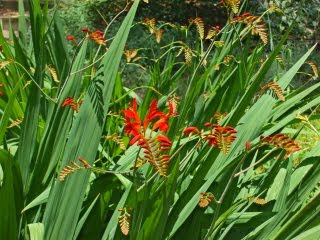 And more good news: Hummingbirds LOVE these lovely red flowers. So, sitting quietly as these lovely blooms 'nod' in the breeze will often produce a wonderful bonus in the form of a busy 'hummer'. And while the hummingbirds are not officially on the guest register at Abbington Green Bed & Breakfast Inn, they are surely an added attraction for the lucky guests who are in the right place at the right time!